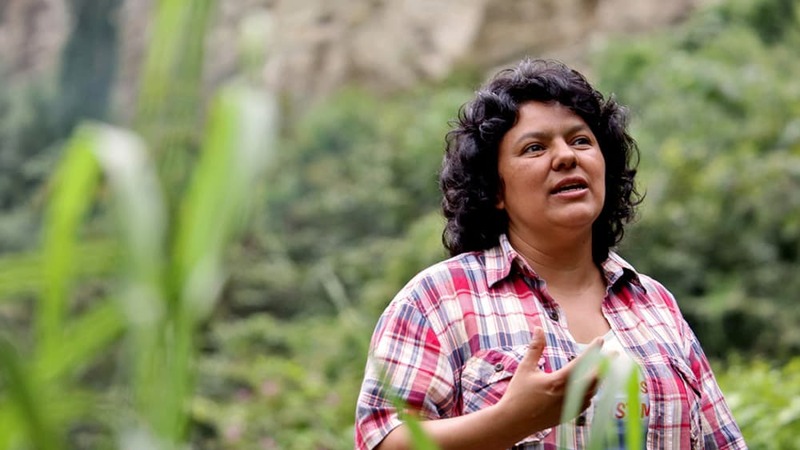 The daughters of slain Honduran environmental and indigenous rights activist Berta Cáceres were in Costa Rica last week to speak at the University of Costa Rica about their mother’s fight against the Agua Zarca dam and their struggle to bring their mother’s killers to justice. Cáceres, who co-founded the Civic Council of Popular and Indigenous Organizations of Honduras (COPINH), was shot to death on March 3 at a home in the western town of La Esperanza. Just a year earlier, she had won the prestigious Goldman Environmental Prize for her work in trying to stop construction of the Agua Zarca dam, which would displace hundreds of indigenous Lenca people. She had received dozens of death threats for her work. Five people were arrested in May in connection with her death, including an employee of Desarrollos Energéticos (DESA), the company in charge of the dam project, an active duty soldier and a retired soldier. Why did you decide to come to Costa Rica? Laura — We came to Costa Rica as part of a series of international visits to continue raising awareness about my mom’s case, to demand justice, to stop hydroelectric projects on indigenous land and to continue calling for an independent international commission to investigate my mother’s death. Berta — The prosecutor is part of MACCIH [Support Mission Against Corruption and Impunity in Honduras, an investigative body backed by the Organization of American States], which was developed specifically to address corruption. But that’s not what we’re asking for. What we want is an independent, interdisciplinary commission of international members overseen by the Inter-American Commission on Human Rights. [The IACHR] presented this proposal two months ago to the government of Honduras. We still have not gotten a response. It would be an international commission with a similar mandate to the one investigating the disappearance of the 43 students in Ayotzinapa [Mexico]. It would independently verify the objectivity of the investigation at all levels of the crime. Five suspects have been arrested for allegedly killing your mother. Are you confident that these are the people behind the crime? Laura — They’ve arrested five people connected to the act of the crime, two of them accused of perpetrating the crime. One [of those arrested] is from the armed forces, a trainer with the military police. Berta — The other was the chief environmental operations officer for the company DESA, Sergio Rodríguez, who we blamed from the beginning. Also, the former security chief of the same company. In spite of the arrests, we’ve seen a series of irregularities in the investigation, including a rush to arrest these suspects when there is insufficient evidence to convict them. They are acting like this is already resolved, that it’s all done. But there’s no looking into the masterminds behind the crime. The operations chief didn’t make this call on his own. There were other people who ordered this who are not being investigated. The fact that someone in the military was involved in this suggests that the government was complicit in the crime. We don’t think the government will investigate these people and that’s why we’re asking for an independent commission. Is there someone in particular you suspect? Laura — We believe that there are powerful economic interests behind the order [to kill my mother]. Beyond individuals, I think it has to do with the businesses and how they operate. We’re very concerned about the general manager of the company [DESA], David Castillo. He’s ex-military who was trained at West Point and has been linked to military intelligence. What role could the U.S. play to encourage the Honduran government to accept an independent commission? Berta — There has been contradictory responses to this case from the U.S. We were very surprised at the high level of interest in the case from some U.S. congressional representatives. But we believe there is support for the Honduran government’s position from the U.S. State Department. Also, the U.S. government needs to wash its hands of any responsibility it may have had in this case, including financing the military units who operate where the project is, USAID’s involvement with the company, and U.S. military policy towards Honduras, which my mother was critical of when she was still alive. We’ve had meetings with memebers of the State Department and they insist we look at other options outside of an independent commission. The U.S. has strong influence with the Honduran government and we think if they would have supported us in [forming an independent commission], it would have already happened. It leaves much to be desired by us as victims, family members and as an organization [COPINH]. We believe the U.S. could do much more. We think that the bill on military cooperation presented by U.S. Representative [Hank] Johnson is very interesting. We believe it’s obvious that the military operates with impunity. Is there an alternative you’d be open to besides this independent commission? Berta — There have also been numerous calls for an independent commission to investigate the case from groups across Europe. The Honduran government says that it’s doing everything it needs to and does not need international participation, but we believe that the commission would benefit the investigation. There are other groups that could lend support, like the United Nations, but we believe the commission would be the best. We’re going to continue fighting for it and, meanwhile, continue fighting for access to information in the investigation. It’s something very basic that is in the law that we’ve been denied. What is the status of COPINH and the movement against the Agua Zarca project? Berta — The company remains in control of the concession. We have an ongoing complaint to cancel it. However, the project continues. Neither the death of my mom nor the death of Nelson García has ended it. There has been a delay in the project but we’re concerned it will be only temporary and it’ll start up again after attention to the case has died down. There are 51 concessions for hydroelectric projects in the area and COPINH has complaints against 49 of them, including the Aguas Zarcas project, for violating laws requiring prior consultation [with affected communities] and access to information. One of the positive things that has come out of all of this is that charges have been filed against the former vice-minister of the Secretariat of Natural Resources and the Environment, Marco Jonathan Laínez, for abuse of authority for granting an environmental license [for Agua Zarca] without an environmental impact study. There’s also a case against the former mayor of Intibucá for abuse of authority for falsifying signatures from the community in support of the project. We will continue to demand the govenment definitively and permanently nullify the concession held by the company. Laura — We remain steadfast in our fight for justice for Honduras and the world. A case like this cannot end in impunity. We all deserve justice.